I am writing this in case anyone is worrying as much as I did about a twin with an irregular head shape (probably brought on by being squashed by their sibling in the womb!). My daughter was born with a stiff neck (torticollis) which meant that she very determinedly lay with her head facing one way only. We were advised by the health visitor to put interesting things in the other side of the moses basket and wedge things around her head to make her look the other way but Zara was, and still is, extremely wilful and wasn’t having any of it. After a few months we realised that her head had become a strange shape where it was flatter on one side and looked twisted. At this stage, after being told repeatedly by the NHS that it would grow out in time, we were worried enough to ask for more help and were referred to a physiotherapist in West Middlesex Hospital. The physio said it should correct itself in time but to help it we should do stretching exercises on her neck and turn her head the other way in her sleep. This we did painstakingly for weeks but it didn’t seem to help. Zara was already 11 or 12 months old and at this stage we instinctively insisted on being referred to a specialist so ended up at Chelsea and Westminster Hospital with Simon Eccles, a cranio-facial specialist. Despite the assurances of the NHS doctors all along he said Zara had a fairly serious case of plagiocephaly which would not correct on its own and due to the facial asymmetry and the very late stage we were trying to get this fixed we should immediately go to a clinic who use special helmets to manipulate head growth in We took her to Ahead4Babies in London who did a digital scan showing her facial asymmetry to be quite bad and her ears to be 1.7cm out of alignment. 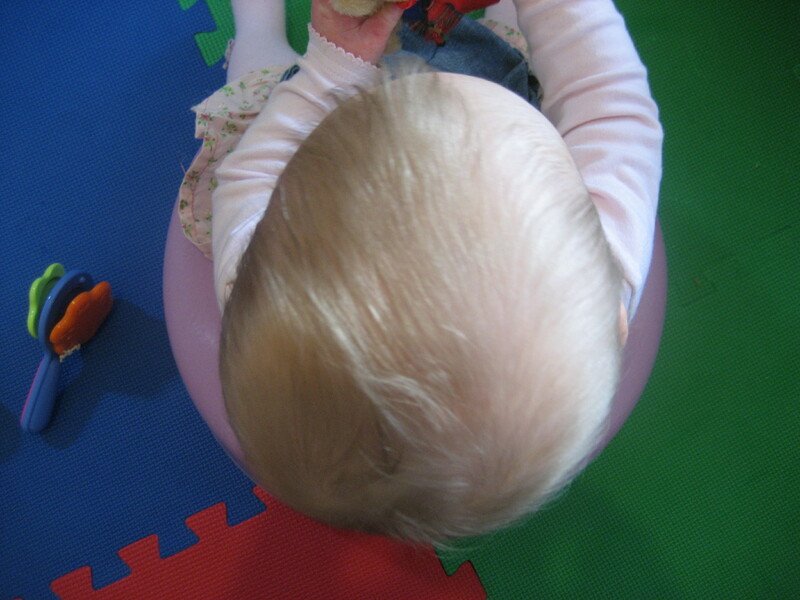 Within 2 weeks, when Zara was 13 months old, she was fitted with a specially made light plastic helmet with solid foam inside which was tight in some areas and left gaps in others to encourage growth in the right direction. After sleepless nights and constant worrying that this helmet would make her unhappy she never once complained or cried about it from the minute it was fitted until it came off. She had to wear it for 23 hours a day, only taking it off to clean it and for baths. In most cases they are left on for a few months but due to her age and the slower rate of head growth she had it for 10 months, with frequent visits for measuring and adjustments. At the end of the treatment her face had become symmetrical and her ears down to only 0.5cm off alignment which is considered minimal so you can’t really tell now. We are so relieved to have found someone who could help us undoubtedly change our daughter’s future and only wish that we had had a better understanding of the problem from the start so that it could have saved months of worry and uncertainty. As with Zara, Emma also had an irregular head shape primarily due to Sam spending the best part of 8 months sitting on her in the womb. Don’t worry she’s getting her own back now. We noticed early on with the help of a osteopath that Emma’s head was more flat on her left side and we were also encouraged to try tips such as putting rolled up towels in her moses basket to get her to to sleep on her other side. As with Zara, none of this made any difference. It was the fact that Emma’s face was not symmetrical which worried us most and she actually looked like a different child when we put her in front of a mirror. Our experience with the NHS went the same way as Zara’s, saying that in time it would sort its self out. We were visiting friends one day and they mentioned that a friend of theirs had a similar problem with their daughter’s head, so we swapped numbers and found out about the London Orthotic Consultancy. They are based in Kingston and offer free initial consultations with measurements to diagnose if there is an issue or not. Emma’s initial measurements show that she had a difference in symmetry of 19mm – most adults have between 0-6mm difference. We started Emma’s treatment straight away with the helmet. Just like Caroline, we were worried that Emma would hate wearing it. She had just started sleeping through the night so I was worried we’d go back to sleepless nights. She was just 20 weeks old when she was fitted for her helmet. As Emma was so young and growing at such a rate we achieved excellent results very quickly. In just 11 short weeks (well they seemed long at the time) she no longer needed to wear the helmet. A huge growth spurt meant her measurements at the end of the treatment were 7mm – just 1 mm off normal range. Our treatment was through a private clinic and in 2009 this cost £2000 all inclusive of helmet adjustments, appointments etc. regardless of how long the treatment lasted. I’m so grateful that we did it so early as Emma had amazing results. While Emma wore her helmet I had so many people with children around 12-18 months come up to me and say they had been told that their child’s head shape would correct itself and it hadn’t. If you are worried I’d thoroughly recommended pushing the NHS or trying a private clinic sooner rather than later.